Looking to replace your torch-on or tar & gravel roof soon? Spray foam roofing may be the right choice for you! Spray foam is usually less money to install, lasts longer, is easier to maintain, and provides energy efficient upgrades at the same time. Island Basement Systems specializes in spray foam roofing installation for residential and commercial roofs. If you're interested in upgrading your roof, call us today at 1-855-206-4811 or click below to get started! We offer free estimates on all our work in Victoria, Nanaimo, Saanich and the nearby areas. In the U.S. and Alberta, spray foam roofing is one of the main re-roofing systems being employed. 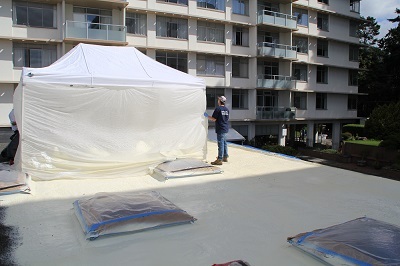 Spray foam is a great choice for Island buildings, whether it's a commercial roof or a home with a flat roof. To install spray foam, the old roofing material is first cleaned up. For example, tar & gravel, the gravel is swept off the and the roof vacuumed. Then a two or three inch layer of high-density closed cell spray foam in applied to the roof decking, followed with a heavy application of a silicone coating. This coating functions as the UV protectant, while the spray foam provides both thermal insulation and the waterproofing. The foam will follow the contour of the roof, so some puddling is expected. Drainage to the existing roof drains is maintained, and sometimes we will install additional drainage to ensure there are no water issues. Once completed, you will have a highly efficient and fully waterproof roof. 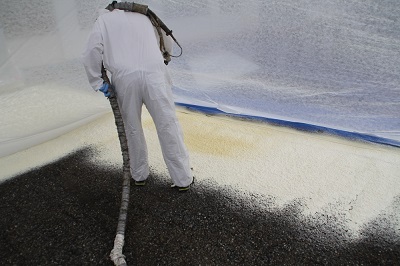 3lb closed cell foam being applied to the roof deck. We use a spray booth when applying the foam to keep the job site neat and clean. After spray foam is installed, a silicone coating is applied to finish the roof. 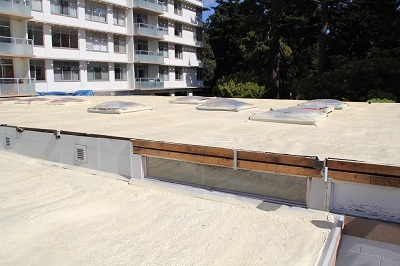 If you own a commercial property or a home with a flat roof, spray foam roofing from Island Basement Systems is the energy efficient upgrade you need. Call us today at 1-855-206-4811 or contact us online to get an evaluate and a free estimate on spray foam roof installation. We offer quality spray foam services in Victoria, Nanaimo, Saanich, Duncan, Campbell River, Langford, Courtenay, Port Alberni, Squamish, Esquimalt and the nearby areas.